Apology is needed here for some dodgy photos but my excuse is that I was juggling my iPhone and a torch and not doing it very well. It occurred to me hours later that I should have swapped hands and I may have had more success so I'll try that next time. 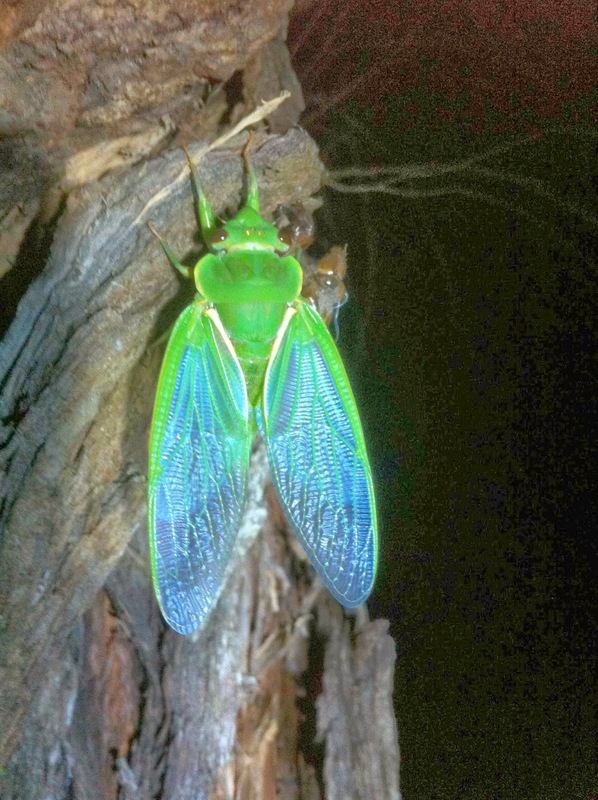 I have been in love with cicadas since I was a small child. In those far off days we often called them locusts, quite inaccurately as they aren't related to locusts at all, and it was the custom of some of the real "old-timers" to call them cicadees. Whatever their name, to me they were magical insects, with an amazing life history and of a most satisfactory and manageable size to a small girl who was obsessed with the natural world. A Black Prince, unfortunately in a deceased state. 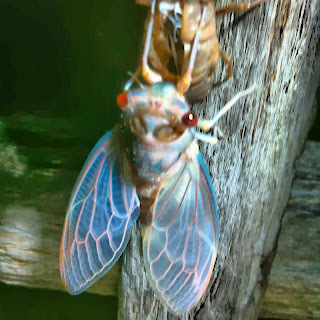 A late cicada. Last year was almost entirely devoid of cicadas. They were all around us, shrilling and drumming, but not in our garden. I was devastated. I wondered what had happened 6 or 7 years ago (before we moved in) that may have killed them off. The few that appeared had deformed wings and it was very distressing to see them trying to fly. 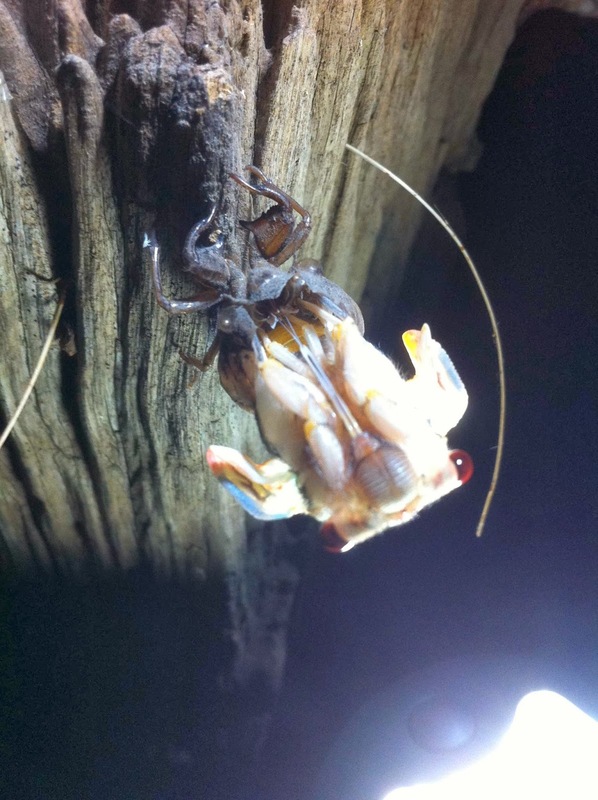 Our local cicadas spend about 6 years underground, unlike the US ones that seem to have 13 or 17 year cycles. A newly emerged Green Grocer. 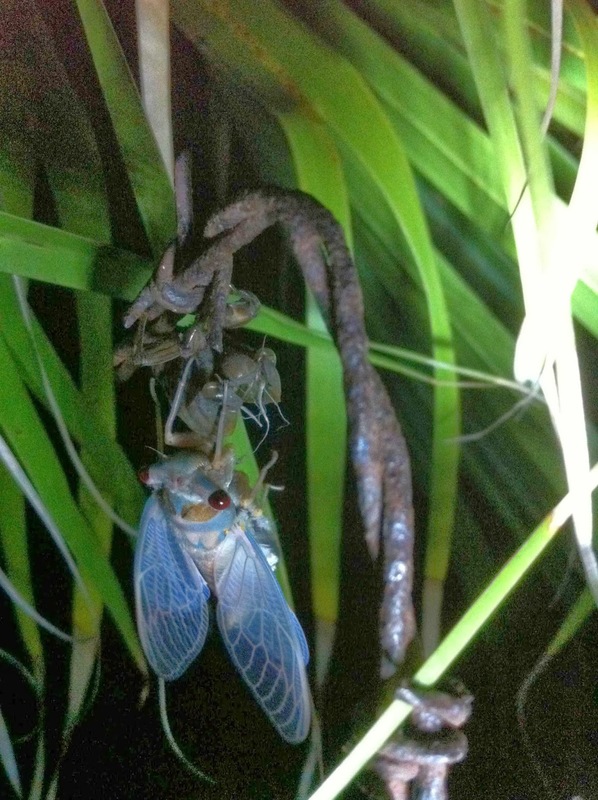 However, last night was a thrilling cicada event. Early in the evening little Jack Russell Peggy became very excited by the tiny holes that were appearing in the ground. She sat riveted to the spot, concentrating, and I think listening to the movements underground. Now and then she'd do a bit of frenzied digging but without success. About 8pm, on a very warm and balmy evening, the little brown nymphs began digging their way out. Very soon the ground around the trees had dozens of cicadas laboriously crawling, and as it got darker it was very necessary to keep the torch aimed at the ground in order not to step on them. Then they started to climb, on the trees, fence posts, garden furniture, barbed wire and metal. Not fussy, as long as they could get a grip. Once secured, the emerging process began. A Green Grocer emerging to show off those beautiful wings. A Blue Moon, new to me, so very thrilling, emerges. 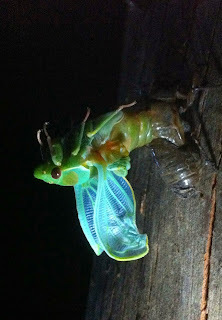 I've never seen this cicada before but having read about it today it seems to be a bit rare but still well known. Last night there were dozens of them! 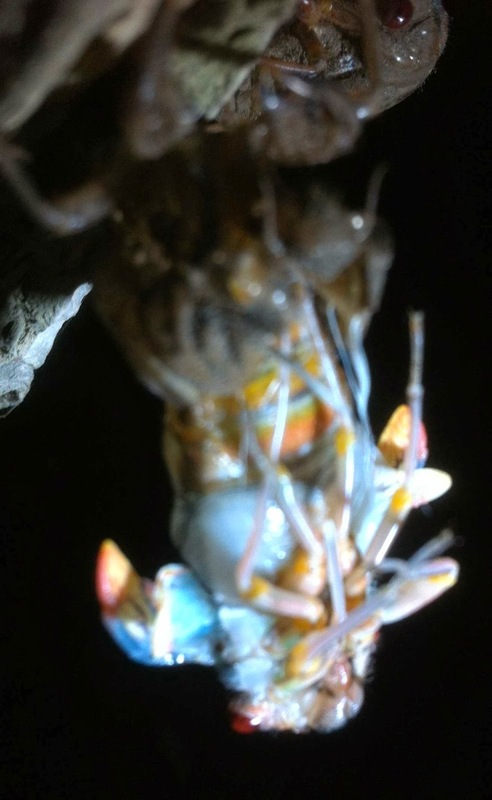 Can you imagine me, trying to take photos in the dark with my iPhone, while bouncing with excitement, and desperate not to stand on any cicadas still making their way to the trees. This morning a quick recce of the garden showed that all had either fully emerged or been an easy breakfast for the baby Currawongs in a nearby nest. There were hundreds of split and discarded cicada cases, much to the delight of the children. 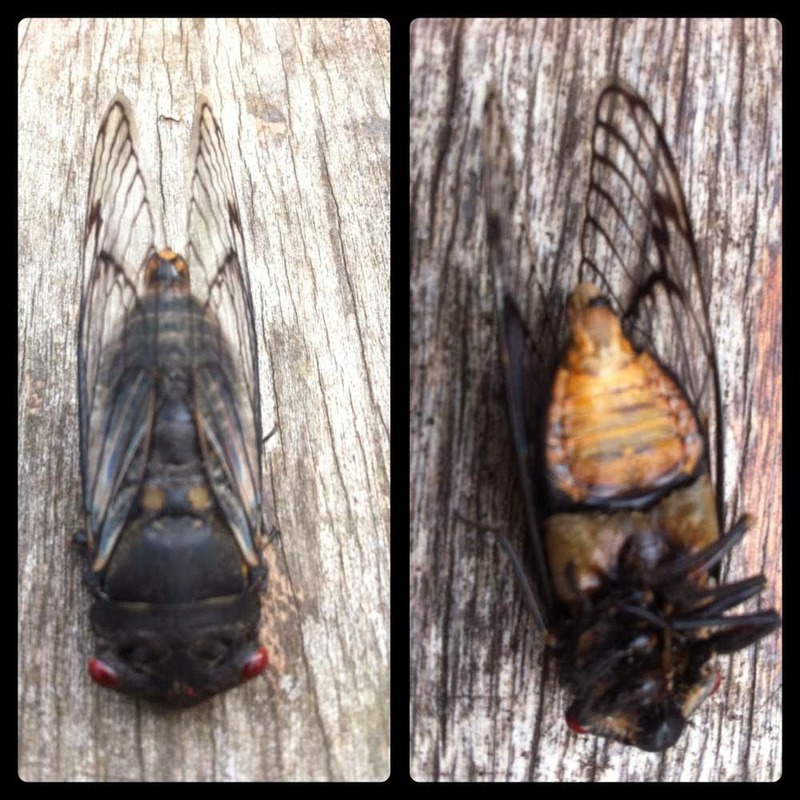 Fia found a couple of dead cicadas, (one the pictured Black Prince) destined for a shallow garden grave where the ants can find them. A Green Grocer with its split casing, and another smaller nymph still to start the emerging process. I'm still hopeful of finding some other favourite cicadas, such as the Yellow Monday, Cherry Nose, Bladder Cicada and the Floury Baker. 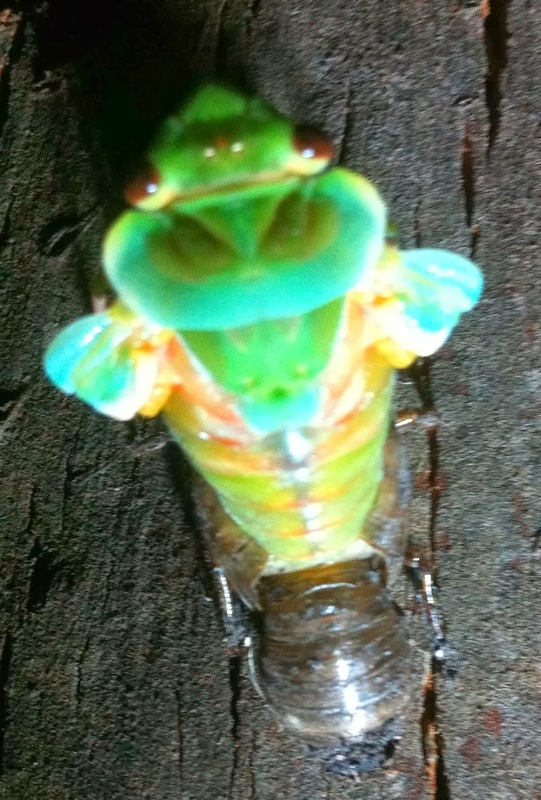 There are about 2500 different cicadas world wide and I think maybe 250 in Australia. 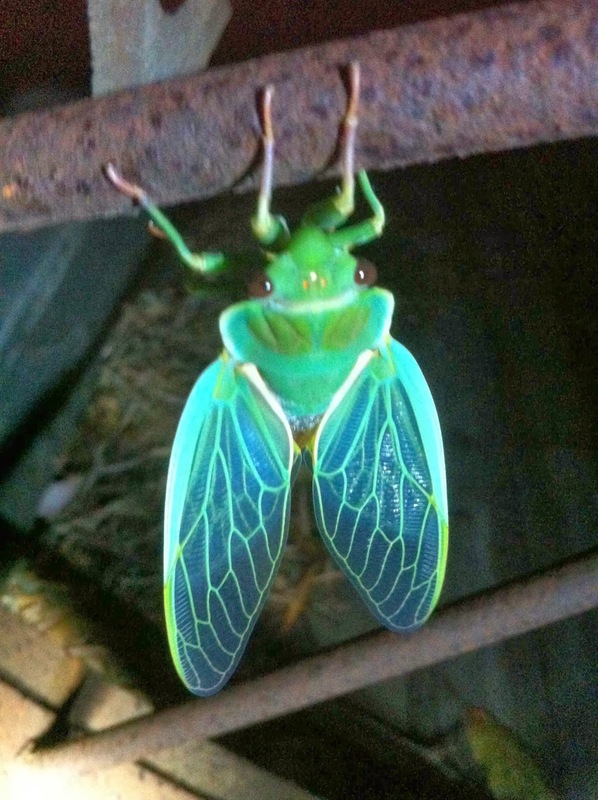 What a cool insect! A Blue Moon that chose to emerge on a piece of barbed wire! Soooo beautiful! Well, now you know another of my favourite things. Sorry about the poor quality of the photos and I hope I haven't freaked anyone out with my cicadas. Like you, Carol, I've had a tremendous fascination with cicadas since childhood. And here, too, last night, the first started shrilling. I absolutely love the sound. It's so easy to sleep against it, that racket. Oh my. Such a treat. I have never, ever seen them emerging. Wow and wow. EC, aren't they just magical? Such a transformation! I never tire of watching it. Not freaked, fascinated by your interest and to me the photos are good. Love their wings and colours are very appealing. What an interesting exercise and considering you were juggling a phone thingy, (I don't possess one of those!) and a torch I think you have done very well. Thoroughly enjoyed it. Thanks Alison, I'm pleased you are as fascinated as I am. They mean summer to me and I so love to hear them singing, raucous as it often is. thank you for your comment on my blog Carol. I dont seem to be able to settle to anything in particular. We dont have cicadas here, but I always loved their insistent sound.when I was on holiday in Tasmania, I didnt realise there were so many different ones, I loved the colour of the green and blue ones. oh I've never seen a Blue Moon or watched them emerging from their shells, what a wonderful post! They are magical and miraculous, Mo. I just love them. Anna, I'd really love to have you by my side as we cicada watched. 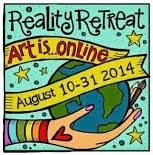 We'll have to do it on our separate sides of the world. What a lovely post! 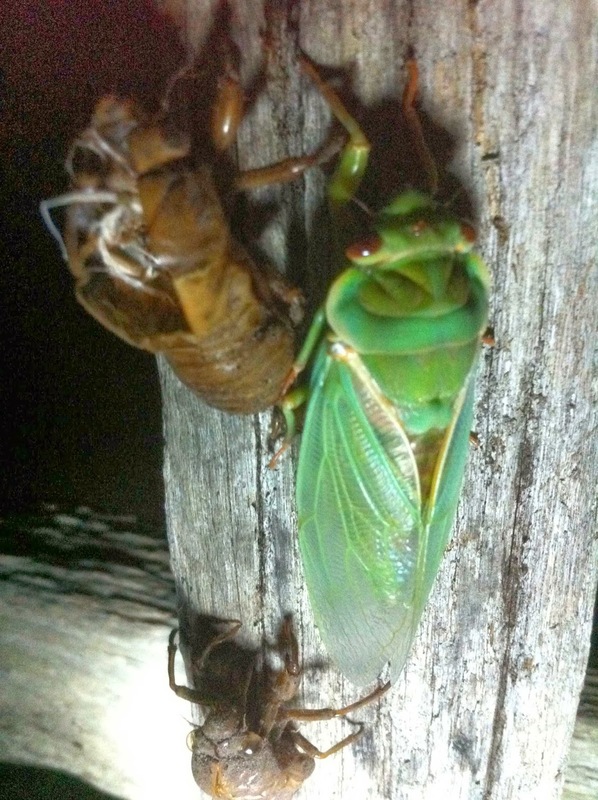 I enjoy cicadas too, but I believe we only have one large green species here. I'll have to do some research! Oh wow Carol! I hear them a lot and come across them in the garden when pruning etc, but have never watched them emerge - fascinating. I can feel your excitement from here and the photos are just fine! Thanks, Fiona, I was excited and will continue to be as long as they are singing. They are really making the most of our beautiful summer weather. B - aren't they really something else? And noisy! Apparently the males, the noisy ones, have the ability to each block out their own sound so they don't deafen themselves! I have never seen cicadas (only heard them occasionally). What fascinating photos! Hilke, they are just stunning, both to look at and to hear. I don't know if they live in England but if they do, I hope you and your twins get to see them sometime. Not at all freaked out, in fact I think I'm in love! They are so beautiful, thank you for showing them to us. Ah, Mig, I'm in love with them too and have been all my life. I'm so pleased that my grandchildren are also fascinated.